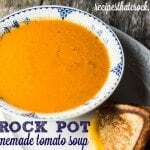 This easy crock pot tomato soup is simple way to make a flavorful homemade tomato soup right at home that beats any pre-made canned soup. Recipe was altered from Slow Cooker Revolution Volume 2's Creamy Roasted Tomato Soup. Cook onions and garlic in skillet over medium high heat until onions are softened then transfer to crock pot. Add tomatoes and their juice, broth and brown sugar to crock pot and cook on high for 3-4 hours or on low for 4-5 hours. Blend using immersion blender directly in crock pot or in small batches using a standard blender until soup is smooth.